Crown Automotive J0938151 Front Wheel Bearing Oil Seal for 1976 Jeep CJ with 2 1/8" Inside Diameter. Front wheel bearing oil seal for 1965-76 CJ. 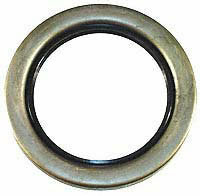 Oil seal has 2 1/8" inside diameter. Crown Automotive Front Wheel Bearing Oil Seal for 65-76 Jeep CJ with 2 7/8" Outside Diameter.